A Mark Chagall exhibition in the centre of Minsk last week became a shining example of civic-business cooperation. The statute of the Grand Duchy of Lithuania also returned to Minsk after being purchased at a Moscow antiques auction for $45,000. The funds were raised as a result of a fundraising campaign initiated by the Mahiliou Historical Museum involving Belarusian citizens, businesses and even the National Bank. Sannikov`s female defense lawyer was barred to leave the country due to accusations of “avoiding mandatory army service”. Freedom House classifies Belarus as a consolidated autocratic regime in its "Nations in Transit 2012" report. Another seven European countries join the EU sanctions. Mark Chagall exhibition in Minsk. 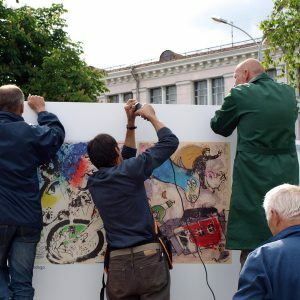 On June 7, an open-air exhibition of reproductions of the works of Belarus-born Mark Chagall was opened in the Yakub Kolas Square in Minsk commemorating the artist’s 125th anniversary. The exhibit, which will be open until mid-September, is a result of over 12 months of planning and negotiations between civil society, government and business. 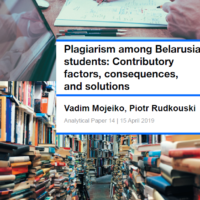 The idea of the project, which received wide coverage in independent and state media, is to educate and unite the deeply divided nation about Belarus-rooted personalities and was developed by the Idea Foundation (Fond of Idea). Initially, the Minsk city authorities were asked to allow the placement of large reproductions on building walls along the main avenues of the city. The request was denied. Through negotiations, the Foundation, which partnered with the French Embassy and the Museum of Contemporary Art, was able to convince Minsk City Executive Committee to allow the exhibition to take place in the Yakub Kolas Square. BelVEB Bank provided full funding for the exhibition. Minister of Culture Latushka opened the event which by some online commentators who stated they “can’t believe this is happening in Minsk”. The disputed Above the Sky goes online. Director of the first Belarusian youth movie "Above the Sky", commissioned by UNDP Office in Belarus as a youth series, and was then much disputed, uploaded the film on youtube.com . As previously informed, in late April, the film crew distributed a video appeal asking UNDP Office to allow a full-length version to screening, suggesting the film may have been subjected to censorship. Committee on commemoration of Vitaly Silitski. A Committee on the commemoration of the first BISS director Vitaly Silitski has been established. The committee consists of about thirty well-known Belarusian and foreign public and academic figures. Among the Committee's activities there is a Scholarship and anAward named after Silitski, as well as publishing of a number of his books. "Life without Barriers". Gomel NGO "Disabled-spinalniki" implements the project "Life without Barriers" with the support of the International Children's Fund. The aim of the project is to assist people with disabilities living in the Gomel region with employment. For this purpose, the organizers conduct trainings and published brochures. Documentary “Together”. The Office for the Rights of People with Disabilities initiated the producing of the documentary "Together" about inclusive education of children with and without disabilities. The film aims to form positive relationship models regarding people with disabilities. A presentation of the documentary "Together" was held on June 6 in Minsk. Summer Camp for Human Rights. In order to promote civic education on human rights and legal protection of the public interest, the Legal Transformation Centre (Belarus), International Forum Burg Liebenzell (Germany), Flying University (Belarus) and others announce a call for applications for VII Summer Camp for Human Rights. The Camp will be held from July 24 to August 3, 2012 in Bad Liebenzell. The participation fee is 80 euros. Meeting "New Media – New Rules." On June 10, cultural portal КУ holds a unique meeting "New Media – New Rules", where representatives of the most famous online resources – Lookatme, Livejournal, and Onliner – will share their expertise in the field of online media, and their views on the prospect of development of Belarusian online media and the blogosphere. The meeting will be held at the hotel "Crown Plaza", Minsk. “Granite” administration ignores independent trade union. The administration of the Mikashevichy enterprise “Granite” refused to provide office room for the independent trade union, though its members addressed a member of the lower chamber of the Parliament Larysa Vershalovich with a request for assistance in solving this issue. Ronald Pofalla about Belarus. In case of an un-free election, the Belarusian opposition has no chance of winning. This opinion was expressed by the head office of the Federal Chancellor of Germany Ronald Pofalla at a press conference in Vilnius on June 8. He also noted that in the future, with the normalization of relations with the EU, Belarus "could perform a very important function – to be a bridge and to link Europe and eastern countries of the continent". Sannikau’s lawyer banned from leaving Belarus. Maryna Kavaleuskaya, a lawyer of a former political prisoner Andrei Sannikau, was banned from leaving Belarus. She could not get to Vilnius on June 7. Residents of the micro-district "Kolodishchi-2" initiate a public expertise. Residents of the micro-district "Kolodishchi-2" near Minsk initiate a public environmental assessment of the project of the residential area "Green Forest". They appealed to the Minsk City Executive Committee and expressed their concern about the planned construction a power plant, a vehicle fleet, and a rail and road junction. This will entail the demolition of about 800 garages and cutting green area. Statute returned to Belarus. The Statute of the Grand Duchy of Lithuania of 1588 was delivered to Minsk. The Statute was sold by a Moscow antiques auction for $45,000. The Mahiliou Historical Museum started a sound fundraising campaign which caused much buzz and managed to help to rapidly collect the necessary sum, involving Belarusian citizens, businesses and even the National Bank of the Republic of Belarus. Nations in Transit 2012. On June 6, the Washington-based Freedom House released its comprehensive, comparative study of democratic development in 29 countries from Central Europe to Eurasia. The report classifies Belarus as a consolidated autocratic regime, in which the economy is controlled by the state with the exception of some limited activity in the private sector. The dimensions "Judicial Framework and Independence" and "Electoral Process" got the lowest scores. UN should address «urgent human rights issues» in Belarus, says high commissioner. The UN high commissioner for human rights will recommend the UN to address “urgent human rights issues” in Belarus. In her report that will be discussed at the UN Human Rights Council’s 20th session to open on June 18, the commissioner says that the rights situation in the country has deteriorated after the December 2010 presidential election. Another seven European countries – Croatia, Macedonia, Montenegro, Iceland, Serbia, Albania and Liechtenstein – have joined the economic and visa sanctions of the EU against Belarus. This statement was made ​​on June 8, byEU High Representative for Foreign and Security Policy, Catherine Ashton. In his annual address Lukashenka outlined the essence of his relationship with the official unions. Stalin would call the official Belarus trade unions driving belts of his policies. But the form of expression does not change the reality – in Belarus, the so-called trade unions constitute a specific substructure of the state apparatus. Lukashenka, as the official press is not particularly sensitive to political niceties, proudly reported that the Chairman Leanid Kozik of the Federation of Trade Unions of Belarus performs his orders in the organisation entrusted to him. Therefore, all ideological, political and practical impact by the official trade unions should be considered to be an adapted version of higher-up state policy. Pension reform is just one example of it. Sometimes these ideas are presented almost as a result of discussions between trade union bosses and employers. In particular, last October Deputy Prime Minister Anatoly Tozik spoke in favour of a pension reform: "I can personally express my opinion. I think that we should think about raising the retirement age, so that people would be interested in retiring later, because the pension would be much higher. " Interestingly, the deputy prime minister spoke a month later his original statement at a meeting with Lukashenka and stated that the retirement age would not increase. This looks like a democratic pluralism. The president with the trade unions clashed in the loop of outright populism, and the government is concerned about the real state of affairs. After all, Belarusian society faces real problems in light of its aging, shrinking population, and declining birth rates. 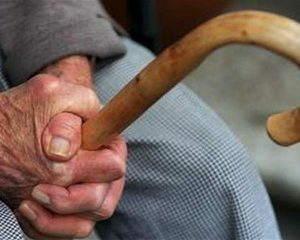 The number of elderly grows, that is to say people collecting pensions, at the expense of a reduction in the proportion of working-age population. Perhaps for these reasons, Anatoly Tozik spoke about the urgent reform of the pension system – the country already has 2.5 million pensioners and 4.5 million working people, and this proportion will only get worse. The active nature of the demographic and social policy of Belarusian authorities is constantly emphasised by state propaganda. On the eve of the most important political campaigns they somehow always seem to manage to find many positives. In reality this policy does not offer solutions but rather represents the inadequate attempts to mitigate the negative effects of the real demographic and social processes. Several years ago, when those born in the mid 1980s reached reproductive age many began to talk about the baby-boom. And now officials express concern about the low numbers of students and pupils in schools. Just one year ago there was a surplus. Similar to the demographic statistics, the process of developing a rather unpretentious. A natural decline in population because of the excess of deaths over births continues to this day for the nineteenth year in a row. Something must really be done, because the content of the growing army of retirees is daunting for workers. In the pension system of Belarus, current pension contributions go to the current pensioners. Those currently working will have to be supported by today's youth, whose numbers have been steadily declining. Today men in Belarus retire at 60 and women at 55. The need to increase the retirement becomes evident. Most democratic states take measures to alleviate this problem. Of course, such measures are unpopular, and they are introduced very slowly. For example, increasing the retirement age takes place over a long period of time and increases for several months a year. In particular, this has been done in Poland and Latvia. The fewer people retire, the more people work, the higher are the pensions in the long-run. But at any given moment popular dissatisfaction with the reform can rise to dizzying heights. If democratic procedures actually work and the political elite is changing, these reforms are more likely to be implemented. If the procedures do not work, as in Belarus, the government can not dare openly undertake such unpopular measures. Therefore, the "fiscal intentions" are clothed in verbal husks and are implemented in a rather contradictory way. A good example is Decree No 136 "On measures to improve pensions to citizens" which established a scheme promoting late retirement. It is likely that the documents would be of considerable interest of pensioners, who are able and willing to continue working. They can abandon their pension and continue to work for five years, so that to get a much higher pension later. Obviously, the decree is addressed primarily to women who have a greater life expectancy. Those who agree to play by the new rules, in fact, will retire when they reach the age of 60. If the experiment is successful, it will be extended to other categories. This is the logic. However, it should be noted that about two fifths of all the men did not reach the age of 60. They are NOT using the pension system, but funding it in the course of their entire working life. Our state does not have a very delicate attitude to individual life, but here we are talking about reversing people’s pockets. Thus, simply increasing the retirement age can not be a problem to solve. In many ways, this measure can be considered the abolition of the pension system at all. Second, everyone knows that after one reaches 40 it is very difficult to find a job in Belarus in accordance with one’s profession, and after 50 – it is nearly impossible. Although the legislation prohibits age discrimination, nearly all employment ads contain age restrictions. Even those which the public employment agencies disseminate. Legal nihilism in Belarus beats the rule of law. For this reason, increasing the retirement age is associated with risk of increased long-term unemployment among the elderly. Kanstantsin Skuratovich, the Agency of Political Expertise. This article originally appeared in Russian on Nashe Mnenie web site and is a part of a new collaborative arrangement with the Agency of Political Expertise.